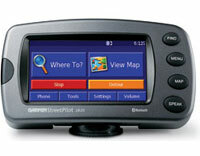 Garmin StreetPilot 2820 (010-00517-06) €0.00 including FREE DELIVERY - buy online at mysatnav.ie Ireland - FREE SHIPPING. Includes automatic routing, clear text-to-speech voice prompts (speaks street names e.g. 'Turn left onto Blackthorn road in 50 metres'), 2D and 3D map perspective, a 3.3" x 1.7" touchscreen, an extensive points of interest database with the ability to add your own POI files. StreetPilot 2820 integrates Bluetooth wireless technology with an included microphone and speaker, so you can talk hands-free on a compatible mobile phone while staying focused on the road. Motorcyclists can connect a Bluetooth-enabled headset or helmet* simultaneously with a mobile phone to talk or receive wireless navigation audio prompts to their destination. *Feature compatibility dependant on helmet or headset support. While the Garmin StreetPilot 2820 is a top of the range GPS with great features it is let down by the lack of an internal battery. We recommend the Garmin zūmo 550 with additional features such as a SiRF GPS receiver and MP3 player - it is much better value for your money and cheaper.